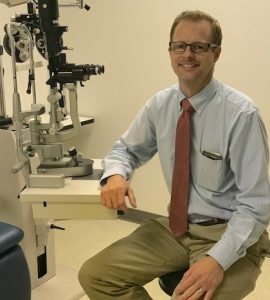 MILLINOCKET, Maine – A new ophthalmologist has joined the staff at Millinocket Regional Hospital. Dr. Jeremy Valentine will be meeting area people at an open house MRH is holding to welcome him on Monday, June 26 from 11 a.m. to 1 p.m. at the White Birch Medical Center, 899 Central Street in Millinocket. Katie Mackin of MRH expressed the organization’s enthusiasm as Dr. Valentine begins his practice. “We are very excited about all that he brings to the table; from basic screenings to cataract surgery,” she said. “His medically-based approach and desire to network with other physicians to identify underlying conditions presenting as vision issues will make him an asset to our vision care practice and our hospital,” Mackin added. Although both Optometrists and Ophthalmologists are involved in eye care, they come from very different educational backgrounds and typically offer different aspects of vision care services. Ophthalmologists are medical doctors who have completed college and have had at least eight years of additional medical training. An ophthalmologist is licensed to practice medicine and complete surgical procedures. Dr. Valentine was born and raised 45 miles south of Salt Lake City, Utah where he’s lived the majority of his life, but things in his Utah community have grown dramatically over the years. The population in the two cities in his area swelled to over 200,000 people, and many big tech companies moved in to the area causing the cost of living to increase. Though they were located at the base of the mountains, they no longer had the ability to take a walk up into the mountains and enjoy the peace and solitude they once did. “That’s what I like about it here. The lifestyle is a little bit slower, there aren’t as many people and the mountains! It kind of reminds me of when I was a kid,” Dr. Valentine said recently. He is currently in the process of relocating his wife and five children to the area where he will work three days a week at MRH. MRH is still seeking a full time optometrist to assist Dr. Valentine with addressing the vision care needs in the Katahdin Region.